Thank You Notes for Parents: Stop waiting for Father’s Day, Mother’s Day, birthdays and elaborate anniversary speeches. You don’t need a special day to say Thank You to your mom and dad. Pick a random moment to express gratitude for the way your parents have brought you up. Acknowledge their undying love and their limitless sacrifices. Take ideas from these quotes to write a message that melts their hearts. Text it, tweet it, post it on Facebook, share it on Pinterest, write it on a cute greeting card or doodle it out on a sweet note – do whatever it takes to make them smile. Even the shortest one-liner will go a long way in making them feel proud to have a child like you. 1) Mom and dad… you’ve gone through a lot of struggle and pain. But I promise, I won’t let all that go in vain. I want to do justice to every time you believed in me. I will grow up, to be the best I can be. 2) Success is in my stride, because I have parents like you by my side. 3) Mom and dad, I grew up cocooned in your love, comforted by your hugs and motivated by your lives… and I wouldn’t have it any other way. Thanks for everything. 4) Dear mom and dad, I have let so many years pass without thanking you both. But you haven’t let a single second pass without loving me unconditionally. 5) I have never taken any compliments to heart because deep down inside I know that all of them actually belong to you both. Thanks for everything, mom and dad. 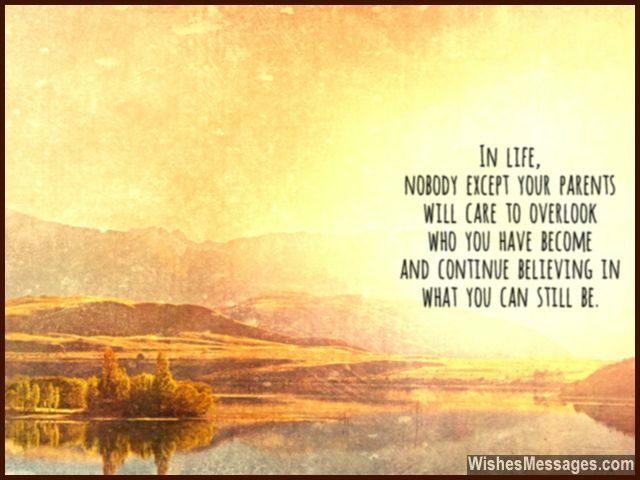 6) In life, nobody except your parents will care to overlook who you have become and continue believing in what you can still be. 7) Congratulations mom and dad. You are the only two people who I love from the bottom of my heart even though you scolded me, punished me and grounded me every now and then. 8) Whenever you nag me I find it extremely annoying, but that is temporary. My heart always knows that no matter what, you always mean well for me. Thanks. 9) You sacrificed your own happiness, just so that I could be happy. It may take a lifetime, but I’ll do everything to repay for what you have done for me. Thanks mom and dad. 10) One day I’ll be successful and people will ask me which college I went to. I’ll say, ‘It doesn’t matter because it is my parents who made me what I am today’. 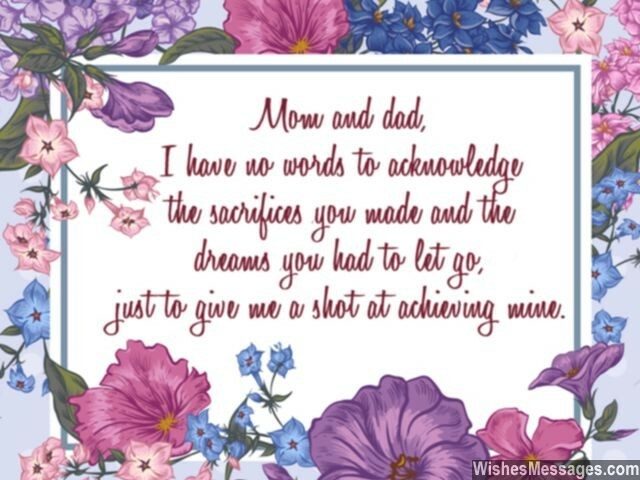 11) Mom and dad, I have no words to acknowledge the sacrifices you made and the dreams you had to let go, just to give me a shot at achieving mine. Thanks. 12) I haven’t done anything to deserve parents as awesome as you. But now, I promise to live a life that does justice to all that you’ve done for me. Thanks. 13) When the world closed its doors on me, you both opened your arms for me. When people shut their ears for me, you both opened your hearts for me. Mom and dad, thanks for always being there for me. 14) Life becomes a CAKEwalk when guided by parents like you so SWEET. Thank you. 15) Mom and dad… of all the friends and teachers I’ve had in my life, you both have been the best. Thanks. 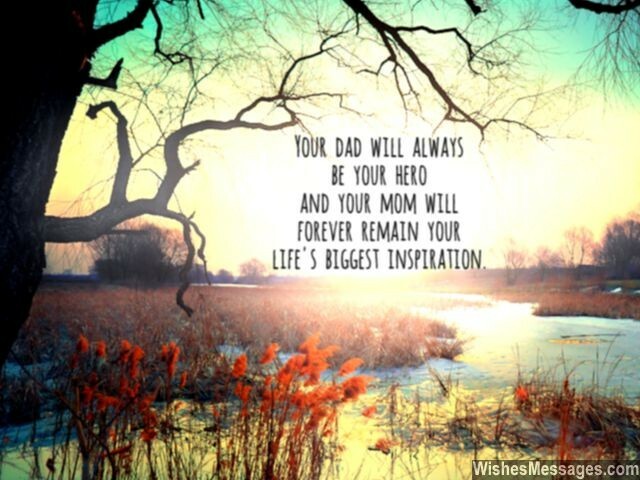 16) I’ve learnt that your dad will always be your hero and your mom will forever remain your life’s biggest inspiration. 17) Thanks for making me the raison d’etre and joie de vivre of your lives. It is because of your upbringing that I am amongst the crème de la crème today. 18) Nothing in my life, would have been without your strife. Nothing I can say, can ever truly convey. Nothing that I do, can show my gratitude for you. Mom and dad you are, the best parents by far. 19) When I was young I always felt that you were constantly on my back. But now I realize that you were simply watching my back. Thanks for everything. 20) Thanks mom and dad for telling me to figure out life’s tough problems all by myself. That is what made me understand that they were not tough in the first place. 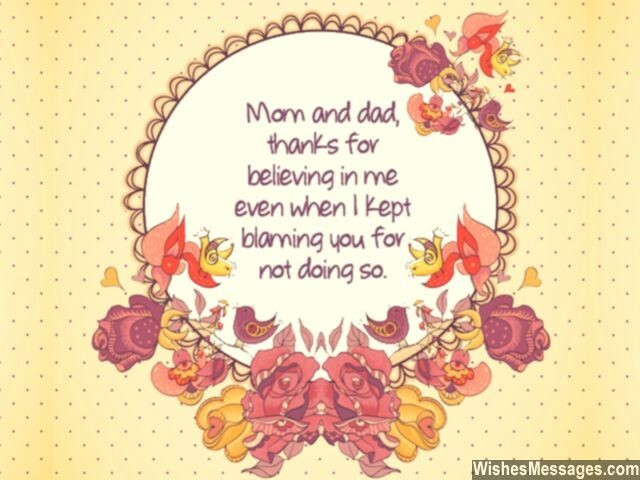 21) Mom and dad, thanks for believing in me even when I kept blaming you for not doing so. 22) I am proud to have a dad who is worthy of being called a good father and a mom who is undoubtedly the world’s best mother. Thanks. 23) I know I am lucky to have parents who love endlessly… me and each other. Thanks for being perfect. 24) I always say I’m strong but deep down inside I know that I can never be as strong as my mom. Thanks for everything. 25) Even though you are a generation older, even though you are my parents… you both have been the best friends I could ever have had. Thanks. 26) Whether it is the way you comforted me when I was down, or the way in which your hugs magically wiped out my frowns. 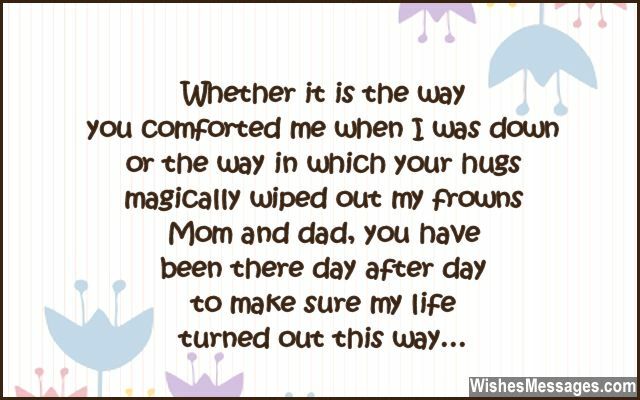 Mom and dad, you have been there day after day, to make sure my life turned out this way. Thank you. 27) I may not have had the best of toys or gone to the best of schools but none of that matters. Because I, had the best parents in the world. I love you, mom and dad. 28) Sacrifice and suffering is a good thing when it is done for the good of the family – this is the lesson your lives have taught me. It will forever be engraved in my mind and my heart. Thanks for everything. 29) I kicked mum when I was inside her tummy. I peed on my dad when he held me in his arms. And still, you love me like crazy. Haha, thanks for everything guys. 30) If I become half the parent that you are today, I’ll consider myself to be successful. Thanks for everything. 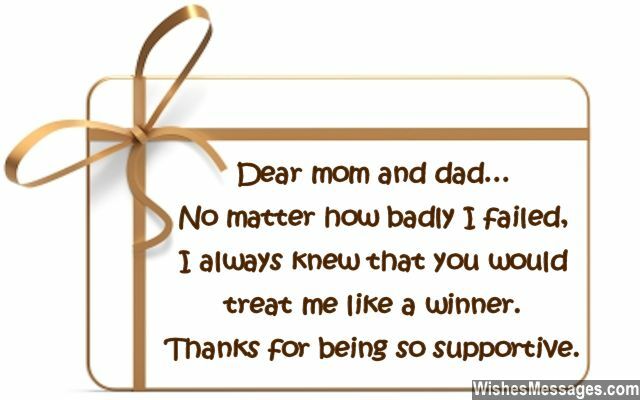 31) Dear mom and dad… No matter how badly I failed, I always knew that you would treat me like a winner. Thanks for being so supportive. 32) I know that I’ll grow up to be the best, because I’ve been raised by the best. Mom and dad, I love you. 33) Parents’ Day came into being in 1994 when former President Bill Clinton signed a law, recognizing the role of parents in a child’s life. But I have loved you both way before that. Thank you, daddy and mommy. 34) If someone asked me to put a price tag on my childhood and the way you have brought me up, I’d just say… no one can afford a childhood like mine because my parents’ love is unmatched and priceless. 35) Families are meant to be, just like ours. Parents are meant to be, just like you. 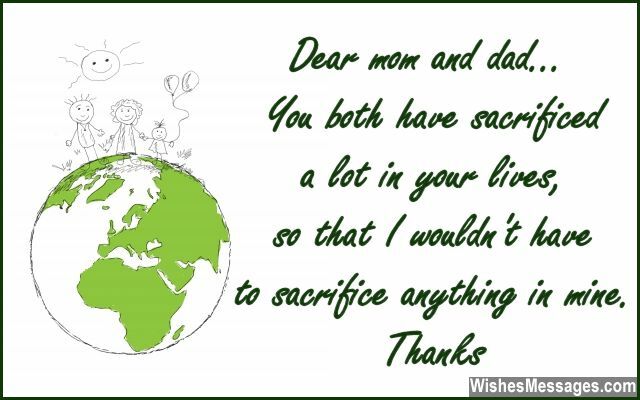 36) Dear mom and dad… you both have sacrificed a lot in your lives, so that I wouldn’t have to sacrifice anything in mine. Thanks. 37) I must have won a lottery, when God was assigning my family. Otherwise I wouldn’t have got, parents who have never fought. 38) Life’s hurricanes can’t touch me because I remain sheltered in your love. Thanks for everything. 39) Determination, commitment and dedication would have remained fancy words without any meaning if you both didn’t implement them in your own life to show me what they really mean. Thanks, mom and dad. 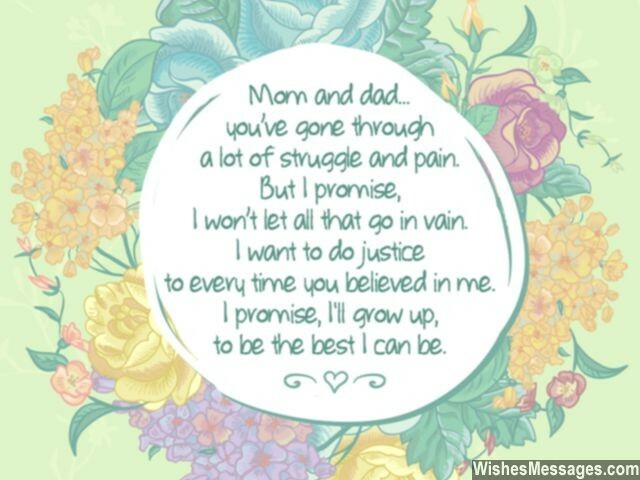 40) Mom and dad, I’ve fought and argued with you a lot, but no more. I can’t believe I insulted the same people who encouraged me to soar. Thanks for everything.